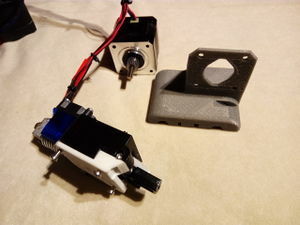 A guide to upgrading your Prusa i3 3D printer to use the E3D-Extruder and a V6 HotEnd. This guide was originally written by Steve Wood of Gyrobot, many thanks for his contribution. 11 Gallery of Finished Conversion. Greg's Wade on the left, E3D on the right. 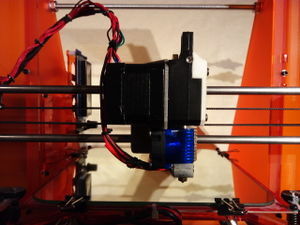 There are many incarnations of the Prusa i3, the one used in this example is but one of them, accordingly there may additional or redundant steps in this guide. Please familiarise yourself with the steps in the guide and establish if it is relevant and possible on your printer before choosing to continue. As briefly mentioned earlier, the plethora of Prusa i3's available makes assuring compatibility hard. 8mm Rods using LM8UU Bearings (or similar). 45mm Rod Spacing, ~15mm Belt Spacing. One bearing on the top rod, two on the bottom, or the other way around. Wire cutters for cutting cable ties. Could use craft knife etc. 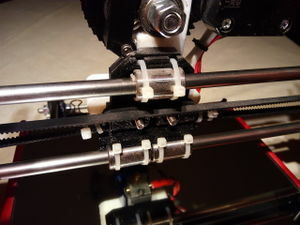 You may find that you can reuse some of your old fixings, this depends on your current printer setup. Some bits left over from upgrade. 1 x Printed 'X' rail carriage. 1 x Printed Extruder assembly. 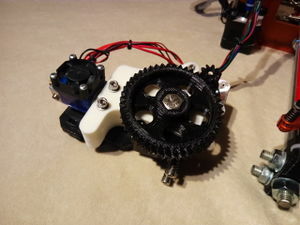 1 x Printed Motor gear. A handful of plastic cable ties. Extruder mount nuts and screws. We are going to remove the old carriage and HotEnd. 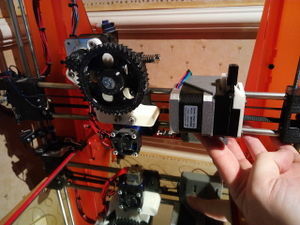 If you already have an E3D-v6 and/or compatible motor installed, of course don't go and disconnect them. Cut the cable ties holding the LM8UU linear bearings in the X carriage. Cut the cable ties holding the two ends of the belts in place. 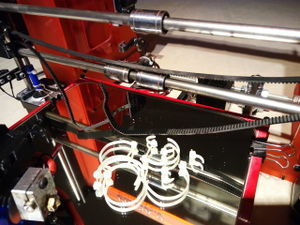 Remove extruder and carriage assembly. Keep the old assembly away from bed to work without risk of bed damage. Remove motor screws (x3) using 2mm hex wrench. Remove gear from motor using appropriate sized hex wernch. 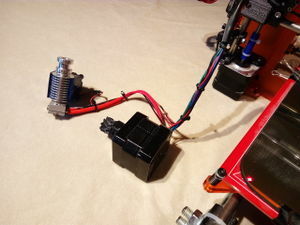 Unscrew and fully retract the two screws that keep the extruder attached to the X Carriage. Pull with a twisting motion the hot end from the extruder taking care to only grab via the heatsink. 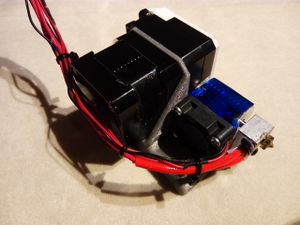 If you intend on replacing the current hot end with a new one then remove the hot end cables from the wiring loom, back to the electronics board and disconnect. 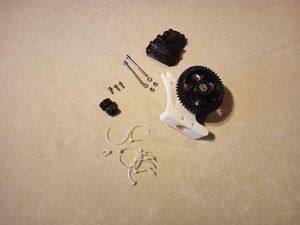 Extruder after dismantling (Was a Wades). If you do not already have an assembled E3D-v6 - follow the E3D-v6 Assembly instructions. Instead of using the bracket shown in the documentation, use the printed bracket specifically for the i3. The spacing of the i3 bracket is the nominal 2mm required for Titan, so you can use the standard, shorter fixings. 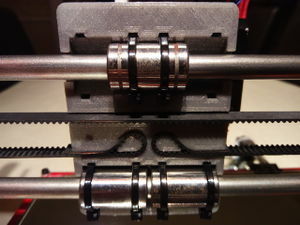 Now that you are done with the extruder assembly, you should have a single assembly with the new X Carriage clamped between the extruder and the motor face. Rear of X-Carriage assembled onto rail, with belt teardrop fixations. The whole X-Carriage can now be offered up to the parallel rails. Locate the LM8UU bearings into the bearing slots on the rear of the carriage. Thread the 2.5mm cable ties though the small slot, they should re-appear on the opposite side of the bearings. Secure the cable ties tight to hold the X-Carriage in place. Release the X-Belt tension pulley then loop the belts around the teardrop anchors and back on themselves so that the belt teeth lock against each other. Slide the belt loops all the way into their respective slots on the back of the X-Carriage. Try to get this as tight as you can, then use the X-Belt tension pulley to achieve final tension required. You may want to refer to the documentation that came with your machine for this step. Front of X-Carriage assembled onto rail. 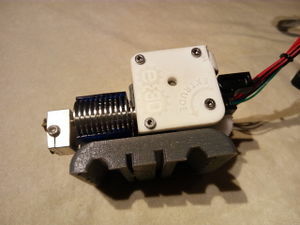 If you already had an E3D HotEnd fitted and are choosing to use this same one with the new extruder then you will already have this wired in back to your electronics board. All that remains is that you suitably tidy up the cables around the newly fitted X-Carriage. If you are fitting a new E3D HotEnd then follow the relevant instructions in the E3D-v6 Assembly Documentation. 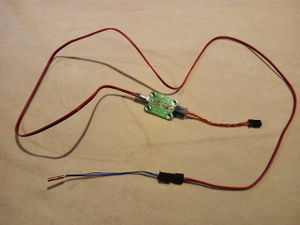 The thermistor will plug directly into the headers where you removed your previous sensor from. Please note that unless you were using a Semitec Thermistor previously, you may need to update your firmware to use the correct thermistor tables. The PT100 amplifier board and thermocouple sensor lead. E3D also offer PT100 and Thermocouple sensors - unless you have one of the more advanced electronics board that has inputs for those sensors, you will need an amplifier to use these. For our printer, we used an E3D-v6 with a PT100 sensor to allow the HotEnd to reach 400°C. 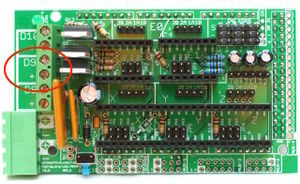 This required the additional PT100 Amplifier board to convert the sensors signal into an analogue output which can be read by the RAMPS. Please note that the PT100 board does not plug into the same place as the thermistor. Instead it plugs into 3 pins, a +5V, a negative and a signal pin. The signal pin will have to be assigned in the firmware to read from the PT100 board. 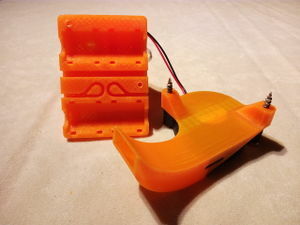 The most common electronics used on the Prusa i3 is the RAMPS 1.4 board and E3D have already produced good documentation on how to connect the PT100 board to RAMPS 1.4 here. There are only two simple changes that may need to be made to the firmware. Once you have made these changes, upload the new version and you are ready to go. Again, refer to the E3D-v6 Assembly Documentation for more information on firmware modifications required. If you choose a PT100 or thermocouple, your HotEnd will be able to reach higher temperatures than with the standard thermistor. Accordingly, your new maximum temperature is 400°C, limited by the Aluminium heater block. For a more in-depth explanation, see the Titan documentation. 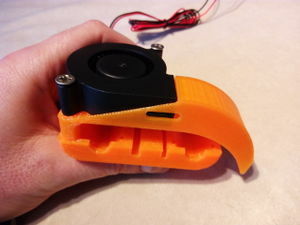 If you would like to add a part cooling fan to the X-Carriage then this is a simple retrofit add-on. 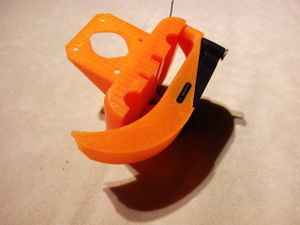 The fan holder is attached after the X-Carriage is already fitted to the printer. 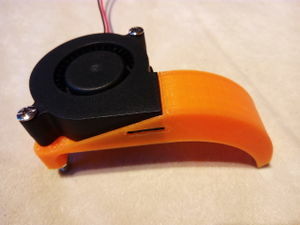 Insert the radial fan onto the printed holder. Attach the two 40mm long screws through the fan and the holder and into to the two holes in the X-Carriage. Insert the fan into the holder. Screw the fan and holder onto the rear of the X-Carriage. A slightly bird like part cooling fan. A slightly boat like part cooling fan. On RAMPS 1.4 you need to tell the Firmware that you are running an Extruder, Cooling Fan and Heated bed combination (EFB). This will then assign Pin 9 to control the fan speed. The part fan cabling needs routing back through the loom to +/- of D9. This page was last modified on 17 November 2017, at 13:29.